The Crawford Fund has been involved in raising awareness of the significance of the Svalbard Seed Vault since it’s launch in 2008. We have enabled journalist visits to the vault to spread the word, facilitated it’s inclusion in the movie “Seed Hunter,” the Australian TV programs “60 Minutes” on Channel 9 and “Destination Flavour” on SBS and numerous print and radio programs. Most recently, we assisted with the visit to Australia by Marie Haga, Executive Director and Dr Luigi Guarino, Director of Science and Programs at the Crop Trust which is the organisation that supports the storage facility. So, it was with some concern that we read incorrect media reports of safety issues with the Seed Vault. To help set the record straight, the Fund assisted with a media outreach for The Hon Tim Fischer AC, former Deputy Prime Minister and chair of the Crawford Fund, who is Vice Chair of the Crop Trust. Speaking from his farm near Albury, Tim Fischer said he has been fully updated overnight on the situation at Svalbard in Norway. “This is by no means an emergency – there has been zero damage to any seed packets in the massive Global Seed Vault buried in an ice mountain at Svalbard, four hours flying north of Oslo,” he said. 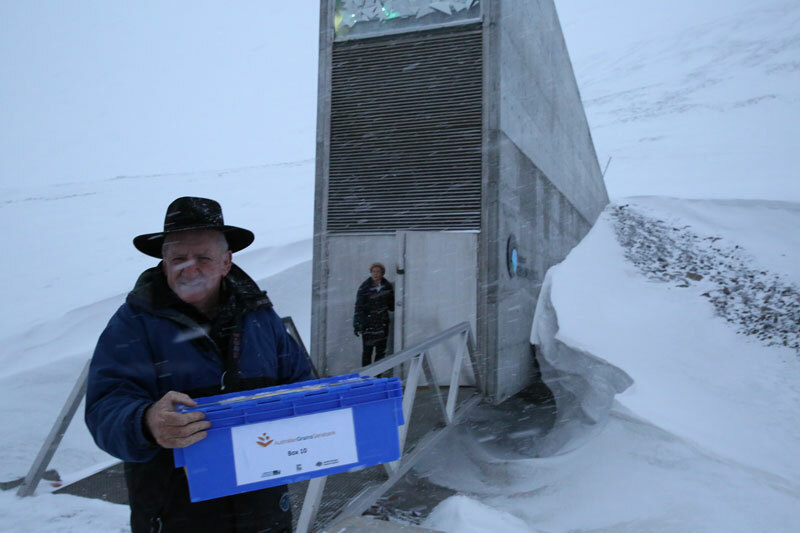 “When water intrudes into the outer part of the seed vault, as it does from time to time, it is immediately removed again by pumps that work around the clock,” he said. Mr Fischer knows the vault well, having visited it in the past, seeing the deposit of Australian seeds to the collection. “The vault has several backup systems and internal doors, remedial work near the entry portal has been carried out after record warm winter temperatures caused a melt in the area permafrost,” he said. The vault is owned and administered for the Crop Trust by the Norwegian Government. A press statement by the Crop Trust explains that the seeds in the vault have never been threatened and will remain safe, with additional planned measures underway to provide additional security, based on the ‘better safe than sorry’ approach. It notes that the measures will provide the most optimal maintenance and surveillance of the installation. Mr Fischer added the Seed Vault and Crop Trust are non-commercial ‘for public good’ operations with many programs in addition to the vault, including collecting ‘Crop Wild Relatives’ like wild rice and grass peas to improve varieties to combat climate change. “With global warming, the Svalbard Global Seed Vault has the golden grain keys to the future of world agriculture,” said Mr Fischer. He noted one example of a cassava seed collected at random a few years ago in Colombia has been used to solve a cassava disease problem in Thailand. Media coverage will be listed here as it is available.